Shopbop does not have many sales, but when they do they’re the best time to take advantage of snagging full price designer items for a discount. I kid you not I take advantage of this sale every year & say the same thing year after year. 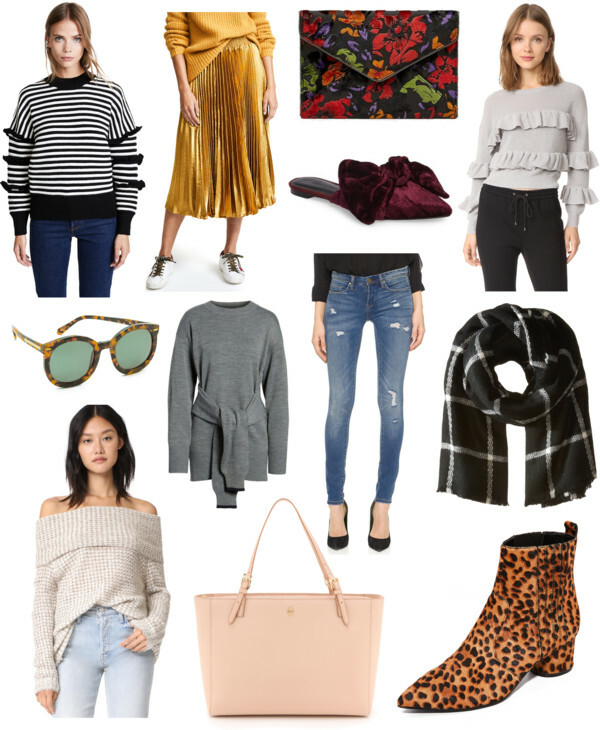 See in this post from 2015 where I rave about how it’s a great time to invest in designer pieces, and then again in this post from 2016. I will continue to say the same thing….if there’s a designer purse, sunglasses, boots or whatever it may be now is the time to invest. I own and love these Karen Walker Sunglasses. I purchased them several years ago during this very sale and they were worth every penny. They are my most worn sunglasses and go with absolutely everything. ALL of the clothing pieces in this post are under $100 making them such steals once you factor in the sale discount. That’s one of the things I love about Shopbop. Although there are plenty of designer items that are pricey, there are also plenty of great affordable pieces as well. These jeans are awesome and so affordable. They’re in my shopping cart right now. This striped ruffled sweater is the cutest and definitely at the top of my wish list. This skirt is amazing and would be great for holiday parties or a night on the town. These booties are so fun and perfect for fall. Although leopard is appropriate any time of year it comes out in full swing during fall and winter. Since so many people resort to black and grey during the cooler months leopard is a great way to add a fun pop to your outfit. Shop all of the sale here. When you’re shopping other items during the sale as long as the item page shows “Key Style” it means it’s part of the sale! There are very few restrictions, so more than likely you’ll see it on everything you click on. The sale ends on September 29th at 11:59pm PT, so don’t delay as things do sell out. Happy shopping!